With about 23.000 enterprises registered a barcode, a millions of Vietnamese products were identified on the shelves of supermarkets. November 2 2017, Directorate for Standard, Metrology and Quality ( STAMEQ) held a workshop“ Improving the application effectiveness of barcode for the products in the Viet Nam ‘s supermarkets” to enhancing the business effectiveness of super market system. However, the application of barcode in Viet Nam is still limited and doesn’t bring high performace. Mr. Tran Van Vinh said. He hopes that STAMEQ together with representatives of VietNam ‘supermarkets will look for the ways to improve the use of barcode for retail, improving business effectiveness and help the people to be easy to find product information and assure clearly the information of products. As one of the practical activities to implement resolution 35 of the Government on supporting and developing the business in the integration process to 2020. The aims of the Forum is enhancing the understanding of the state and private sectors, small and medium enterprises (SMEs) on role of national quality infrastructure (NQI) includes standards, technical regulations, technical document on metrology and conformity assessment; Support small and medium enterprises in ASEAN, and other enterprise integrate into the regional and international economy. At the same time, the Forum provided an overview of technical barriers to trade and regulations on TBT in Vietnam’s key export markets as well as how to approach and overcome technical barriers to promote the export of Vietnam’s key products to major markets in the world. The forum is an opportunity for enterprises to discuss about issues in standardization, metrology and quality. However, according to the experts, the use of barcodes in our country is still limited. Due to the rapid increase in the use of unregistered and unsatisfactory barcodes and unregistered foreign barcodes, it is difficult to manage the products in the supermarkets. And it affects the business effectiveness that use the barcode. 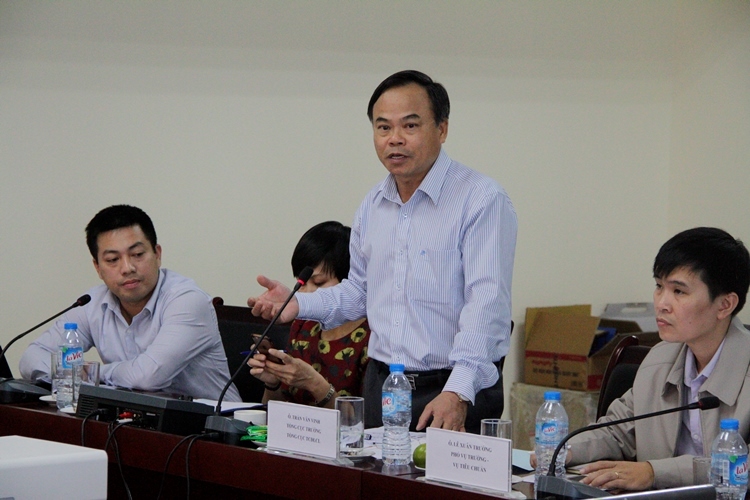 According to Mr.Vu Vinh Phu – Member of executive committee of Vietnam Post and Telemarketing Association: it is difficult to purchase the goods because origin of the goods are not clear, the goods without barcode. The application of barcodes to the traceability of goods such as pork, egg in Ho Chi Minh City. Ho Chi Minh city has been deployed for many months but still has many problems. ” The traceability of goods via the barcode is a necessary condition but not sufficient. We have to study seriously to use the barcode more effectively in production and distribution system in Vietnam, ” Mr. Vu Vinh Phu said. According Mr Dinh Tien Thanh – General Director of Viet Nam Intimex corporation company: Current in the supermarket system, the unfrozen products as pork, fish, vegetable and fruits.. without the barcode, only have supermarket code to manage the goods. So he suggested STAMEQ to develop the specific code for these goods so that the consumers can indentify them more easily. Also at the workshop, the representatives of STAMEQ has introduced on the national database on barcode, Scan & Check software on mobile phones and barcode solutions to verify the origin of products and goods.